The Fayette County Chamber of Commerce Ambassadors recently cut the celebratory ribbon at The Noble Pig, 131 E. Court St. in Washington C.H. Formerly The Village Homestead, Jeremy and Erica Cawley have a new name and new address. This building, beautifully restored by Christy Larrick and Ben Snodgrass, allows the Cawley family more room for merchandise, as well as a space for classes. Clothing, paint supplies, furniture, décor, coffee, and so much more! Follow The Noble Pig on Facebook and be sure to stop in and support a family that is investing in Fayette County. 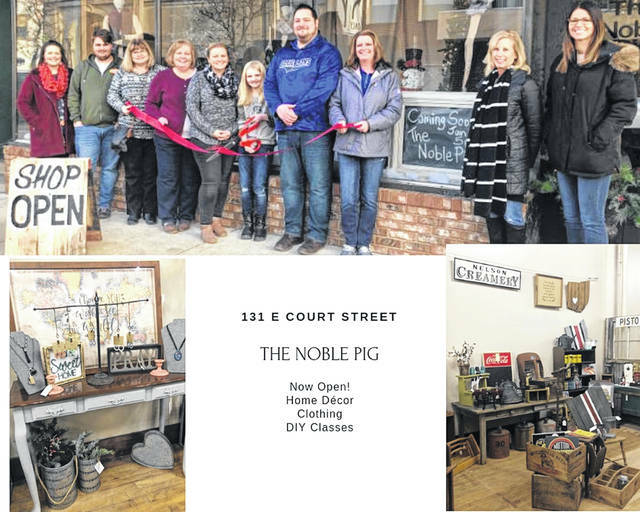 https://www.recordherald.com/wp-content/uploads/sites/27/2019/01/web1_Photo-Collage.jpgThe Fayette County Chamber of Commerce Ambassadors recently cut the celebratory ribbon at The Noble Pig, 131 E. Court St. in Washington C.H. Formerly The Village Homestead, Jeremy and Erica Cawley have a new name and new address. This building, beautifully restored by Christy Larrick and Ben Snodgrass, allows the Cawley family more room for merchandise, as well as a space for classes. Clothing, paint supplies, furniture, décor, coffee, and so much more! Follow The Noble Pig on Facebook and be sure to stop in and support a family that is investing in Fayette County.